The regulated expression of ICAM-1 plays an important role in inflammatory processes and immune responses. The present study aimed to determine the in vivo involvement of cytosolic phospholipase A2α (cPLA2α) in ICAM-1 overexpression during inflammation and to elucidate the cPLA2α-specific role in signal events leading to ICAM-1 upregulation in endothelial cells. cPLA2α and ICAM-1 upregulation were detected in inflamed paws of mice with collagen-induced arthritis and in periepididymal adipose tissue of mice fed a high-fat diet. Intravenous injection of 2 mg/kg oligonucleotide antisense against cPLA2α (AS) that reduced cPLA2α upregulation also decreased ICAM-1 overexpression, suggesting a key role of cPLA2α in ICAM-1 upregulation during inflammation. Preincubation of endothelial ECV-304 cells that express ICAM-1 and of HUVEC that express ICAM-1 and VCAM-1 with 1 μM AS prevented cPLA2α and the adhesion molecule upregulation induced by TNF-α and inhibited their adherence to phagocyte like-PLB cells. Whereas AS did not inhibit NADPH oxidase 4-NADPH oxidase activity, inhibition of oxidase activity attenuated cPLA2α activation, suggesting that NADPH oxidase acts upstream to cPLA2α. Attenuating cPLA2α activation by AS or diphenylene iodonium prevented the induction of cyclooxygenase-2 and the production of PGE2 that were essential for ICAM-1 upregulation. Inhibition of cPLA2α activity by AS inhibited the phosphorylation of both p65 NF-κB on Ser536 and protein kinase A-dependent CREB. To our knowledge, our results are the first to show that CREB activation is involved in ICAM-1 upregulation and suggest that cPLA2α activated by NADPH oxidase is required for sequential phosphorylation of NF-κB by an undefined kinase and CREB activation by PGE2-mediated protein kinase A.
Vascular inflammation is a pivotal event in the pathogenesis of many human diseases, including atherosclerosis, hypertension, restenosis, septic shock, autoimmune diseases, and ischemia/reperfusion damage (1, 2). In health, the endothelial cell surface of the vascular lumen is a relatively nonadhesive and nonthrombogenic conduit for the cellular and macromolecular constituents of the blood. Under inflammatory conditions, interactions between endothelial cells and blood constituents or extracellular matrix occurred by the production of adhesion molecules and their shedding onto the endothelial and leukocyte surfaces (3). ICAM-1 is a cell-surface glycoprotein member of the Ig superfamily (4). As the counterreceptor for the leukocyte β2 integrins, ICAM-1 plays a central role in inflammatory and immune responses. Although ICAM-1 is constitutively expressed, its upregulation on cytokine-activated vascular endothelial cells controls the targeted transmigration of leukocytes into specific areas of inflammation (5). Induction of ICAM-1 gene transcription by TNF-α has previously been shown to be dependent on NF-κB activation and its binding to ICAM-1 promoter (5, 6). The VCAM-1 that mediates the adhesion to monocytes and lymphocytes is also an inducible cell-surface glycoprotein on several cell types and implicated in a number of inflammatory responses. Similar to ICAM-1, induction of VCAM-1 by TNF-α has been shown to be dependent on NF-κB activation (5). The phospholipase A2 (PLA2) superfamily consists of a broad range of enzymes that are defined by their ability to specifically catalyze the hydrolysis of sn-2 ester bond of glycerolphospholipids (7, 8). Considerable attention is focused on cytosolic PLA2α (cPLA2α), which exhibits a specific preference for arachidonic acid (AA), the precursor for generation of biologically active eicosanoids (9), including PGE2. PGE2 plays an important role in the signal transduction cascade events during induction of gene transcription (10, 11). Our recent study (12) demonstrated that there is a significant elevation in cPLA2α expression and its metabolites in the inflamed site in two mouse models of inflammation: collagen-induced arthritis (CIA) and thioglicollate-induced peritonitis. In vivo inhibition of elevated cPLA2α protein expression by i.v. administration of oligonucleotide antisense resulted in a dramatic reduction of the inflammatory process and a significant reduction of recruited neutrophils to the site of inflammation in both mouse models of inflammation. The present study aimed to determine the in vivo involvement of cPLA2α in ICAM-1 upregulation in mouse models of inflammation and to determine its specific role in signaling events leading to induction of ICAM-1 protein expression in endothelial cells. In addition, the role of cPLA2α in VCAM-1 upregulation was determined. Antisense oligonuclotides against cPLA2α were engineered using the computer-based approach RNADraw V1.1 (Mazura Multimedia) and used as described in our previous study (12). A combination of three oligonucleotide antisenses (TCAAAGGTCTCATTCCACA, CAAAACATTTTCCTGATTAGG, and GCTGTCAGGGGTTGTAG) and their corresponding senses with phosphorothioate modifications on the last three bases at both 5′ and 3′ ends was used. This antisense combination was found to be much more efficient than each individual and of other antisense combinations studied (not shown). The specificity to cPLA2α was analyzed by the Basic Local Alignment Search Tool search program. The mouse model of CIA was induced by immunizing susceptible animals (DBA/1 mice) with bovine type II collagen (CII) as described (12) using bovine CII prepared at the Kennedy Institute of Rheumatology or purchased from Sigma-Aldrich (St. Louis, MO). All mice were maintained in a specific pathogen-free environment and were fed standard mouse chow and water. Bovine CII was dissolved overnight at 4°C in 10 mM acetic acid at a concentration of 4 mg/ml and emulsified with an equal volume of CFA, which was prepared by dissolving H37Ra Mycobacterium tuberculosis (Difco Laboratories, Detroit, MI) in IFA (Sigma-Aldrich) at a final concentration of 4 mg/ml. CIA was induced by intradermal injection of 100 μl emulsion containing 200 μg CII to 8-wk-old mice at the base of the tail and boosted on day 21 with CII emulsion in IFA. The severity of arthritis was assessed as described in detail in our previous study (12). Male C57BL/6J mice (The Jackson Laboratory, Bar Harbor, ME) at 6 wk of age were fed either a low-fat diet (LFD; 6% calories from fat; Harlan Teklad 2018sc) or a high-fat diet (HFD; 60% calories from fat; research diets #12492), as previously performed (13, 14). At 0 and 3 d, mice were euthanized by CO2, and periepdidymal fat was dissected out, immediately fixed in 4% formaldehyde, or snap frozen and stored in liquid nitrogen until further analyzed. Both studies were approved by the Ben-Gurion University Institutional Animal Care and Use Committee (IL-35-2006 and IL-08-01-2009). Primary HUVEC were obtained from ScienCell Research Laboratories or were isolated from freshly obtained human umbilical cord by using the method described by Jaffe et al. (15). Briefly, the umbilical vein was rinsed twice with PBS containing 100 U/ml penicillin/streptomycin and 0.2% collagenase I (Worthington Biochemical) and incubated for 15 min at 37°C. After harvesting, endothelial cells were placed in 75 cm2 tissue-culture flasks and grown in endothelial cell medium (ScienCell Research Laboratories). HUVECs used in the experiments were between their third and sixth passages. The phenotype of the endothelial cell was confirmed by performing immunofluorescence analysis using mAb of von Willebrand factor (BD Biosciences, San Jose, CA). The study was approved by the Helsinki Committee of Kaplan Medical Center 0075-10-KMC. Endothelial cells (ECV-304 and HUVEC) and PLB-985 (PLB) cells were cultured in RPMI 1640 medium supplemented with 10% FCS, 1% glutamine, and 1% antibiotics (100 mg/ml streptomycine, 12.5 mg/ml nistatin, and 10 mg/ml penicillin). Optimal concentrations of 1.25% DMSO or 5 × 10−8 M 1,25(OH)2D3 were added to PLB cells at their logarithmic growth phase for 4 d to induce differentiation toward neutrophil- or monocyte-like cells, respectively. Differentiation was determined by Mac-1 surface expression using FACS analysis (16). The expression of cPLA2α and of ICAM-1 was detected as previously described (12, 17). Nonspecific reactivity was inhibited by incubation of deparaffinized tissue sections mounted on slides for 30 min in a solution of 4% normal horse serum (avidin–biotin VECTA-STAIN Kit Elite PK 6105; Vector Laboratories, Burlingame CA). The sections were then incubated with 1/1000 dilution of a mouse mAb against mouse cPLA2α (Santa Cruz Biotechnology, Santa Cruz, CA) or Ab against ICAM-1 (R&D Systems, Minneapolis, MN) in PBS for 2 h at room temperature. Sections were incubated with second Abs (1/200 dilution), biotinylated goat anti-mouse IgG or rabbit anti-rat IgG, respectively, followed by avidin–biotin complex/HRP and diaminobenzidine for developing brown staining. Slides were counterstained in hematoxylin. For every staining procedure, a negative control was prepared without the primary Ab. Cell lysates (16, 18) and tissue lysates (12, 14) were prepared as described in detail in our previous studies. Lysate proteins (35–50 μg) were separated by electrophoresis on 7.5% polyacrylamide SDS gels. The resolved proteins were electrophoretically transferred to nitrocellulose, which was stained with Ponsue red to detect protein banding, and then blocked in 5% milk in TBS (10 mM Tris and 135 mM NaCl [pH 7.4]). Immunoblot determination was done as described before (18) using primary Abs against cPLA2α, p-cPLA2α, CREB, p-CREB p65, p-p65, cyclooxygenase-2 (COX-2; Cell Signaling Technology, Beverly, MA), ICAM-1, and VCAM-1 (R&D Systems) for overnight incubation at 4°C and second Abs, peroxidase-conjugated goat anti-rabbit or anti-mouse (Amersham Biosciences, Buckinghamshire, U.K.), for 1 h at room temperature and developed using the ECL detection system (Amersham Biosciences). For immunoblot detection of CREB and p65, the nuclei fractions of 2 × 106 cells were immediately solubilized in electrophoresis sample buffer and processed for separation on 8% SDS-PAGE. cPLA2α activity was performed as described before (16) using sonicated dispersions of 1-stearoyl-2-[14C]arachidonyl phosphatidyl choline (30 μM, 50,000 dpm/assay) and sn-1,2-dioleoylglycerol (molar ratio 2:1) in an assay mixture containing 5 mM DTT. Briefly, the assay mixture contained the phospholipid substrate in 80 mM KCl, 5 mM CaCl2, 5 mM DTT, 1 mg/ml BSA, 1 mM EDTA, and 10 mM HEPES (pH 7.4). The reaction was started by the addition of 50 μg cytosolic protein (within the linear protein range of the assay) and incubated at 37°C in a shaking water bath for 10 min. Nuclear protein extract preparation was performed as previously described (12, 19) and analyzed by electrophoresis on 8% SDS-PAGE. Confluent ECV-304 cells were incubated in a 24-well plate with resting or stimulated differentiated PLB cells (1 × 106 cells/well) for 15 min (within the linear range) at 37°C. Cell stimulation was preformed using 50 ng/ml PMA. Nonadherent cells were removed by three washes with warm PBS. Differentiated PLB cells together with the endothelial cells were detached by incubation with trypsin-EDTA for 3 min followed by addition of 5 ml PBS. The cell suspensions were centrifuged for 10 min (1500 rpm) and analyzed by FACS (Beckman Coulter, Fullerton, CA). Phagocyte superoxide anion (O2−) production was measured as the superoxide dismutase-inhibitable reduction of acetyl ferricytochrome c by the microtiter plate technique, as previously described (16). Cells (5 × 105/well) were suspended in 100 μl HBSS containing acetyl ferricytochrome c (150 mM) and stimulated by the addition of 50 ng/ml PMA. The reduction of acetyl ferricytochrome c was followed by a change of absorbance at 550 nm at 2-min intervals on a Thermomax Microplate Reader (Molecular Devices, Menlo Park, CA). The maximal rates of superoxide generation were determined and expressed as nanomoles O2−/106 cells/10 min using an extinction coefficient (E550) of 21 mM−1 cm−1. Endothelial cell O2− production was measured (20) as described using dihyroethidium (DHE). ECV-304 cells (5 × 104 cells/well) were incubated in a 96-well plate for 45 min at 37°C in HBSS containing 10 μM DHE. The cells were stimulated with TNF-α, and the fluorescence intensity (relative fluorescence units) was measured at an excitation wavelength of 485 nm and an emission wavelength of 590 nm using a fluorescence microplate reader (CytoFlorTM 2300, TECAN; Cambridge Scientific, Cambridge, MA). The surface expression of CD11b, ICAM-1 (CD54), and VCAM-1 (CD106) were determined as described before (19) by mixing 5 × 105 cells with 10 μg FITC- conjugated mouse monoclonal anti-human–CD11b (Biolegend, San Diego, CA), FITC- conjugated mouse monoclonal anti-human–ICAM-1, or FITC-conjugated mouse monoclonal anti-human–VCAM-1 (R&D Systems) at 4°C for 40 min. The negative isotype-matched control was the FITC-conjugated mouse IgG2b monoclonal Ig isotype control (BD Pharmingen, San Diego, CA). After two washes with PBS, cells were analyzed by FACS. For each sample, 10,000 light scatter-gated viable cells were analyzed. The median (median of fluorescence intensity) was calculated by subtracting the nonspecific fluorescence. PGE2 levels were determined in cell supernatants by using a dextran-coated charcoal radioimmunoassay protocol. The samples were immediately stored at −70°C and analyzed within 1 wk from the experiments. Briefly, 100 μl sample or PGE2 standard (Sigma Israel, Rehovot, Israel) were incubated in the presence of 500 μl anti-PGE2 anti-serum (Sigma Israel) for 30 min. [3H]PGE2 (Amersham Biosciences) was added next for 24 h at 4°C. Twenty-four hours later, 200 μl cold dextran-coated charcoal suspension was added to each tube and incubated for 10 min on ice. The tubes were centrifuged at 3500 rpm for 15 min at 4°C. A total of 500 μl supernatants containing [3H]PGE2–anti-PGE2 complexes were counted (Packard Spectrometry 1900CA; Packard Instruments), and the amount of PGE2 was calculated. Total cellular RNA was extracted, and cDNA was prepared exactly as described in detail in our previous study (21). cDNA was amplified via PCR using Thermus aquaticus DNA polymerase under conditions found to amplify cDNA molecules in a linear fashion. For detection of the E-prostanoid (EP) receptors, we used published primers (10) that were used by us before (19). PCR amplification was performed in a microprocessor-controlled incubation system (Crocodile II; Appligene, Plessanton, CA). The reaction was carried out with 1 μM 5′ and 3′ primers in 50 μl reaction mixture using a step program for FcγRIIA: 94°C, 1 min; 55°C, 30 s; and 72°C, 2 min (25 cycles) and for EPs: 94°C, 1 min; 63°C, 1 min 10 s; and 72°C, 1 min 40 s (EP4: 31 cycles; EP1, EP2, and EP3: 40 cycles). A 10-μl sample of the completed reaction mixture was run on a 2% agarose gel stained with ethidium bromide. The in vivo role of cPLA2α in ICAM-1 upregulation was studied in two mouse models of inflammation: CIA and HFD-induced obesity. We have shown previously (12) by immunoblot and immunohistochemistry analysis that cPLA2α was upregulated in inflamed joints of DBA mice with CIA, and this process was significantly reduced by i.v. administration of oligonucleotide antisense against cPLA2α (AS). Therefore, similar experimental approaches were used to determine a putative role of cPLA2α on the induction of ICAM-1 at sites of inflammation. The expression of ICAM-1 and cPLA2α proteins was assessed in paws of healthy DBA mice (clinical score of 0 and paw thickness of 2.4 mm) in inflamed paws of DBA mice with CIA (clinical score of 3 and paw thickness of 4.2 mm) and in paws of DBA mice significantly recovered from inflammation by daily i.v. AS injection (2 mg/kg) for 7 d (clinical score of 1 and paw thickness of 3.1 mm). As shown in Fig. 1A, immunoblotting of total paw lysates showed upregulation of both cPLA2α and ICAM-1 proteins in the inflamed paws compared with a tissue of healthy control preparation. Inhibition of cPLA2α overexpression by i.v. AS injection caused a significant reduction in ICAM-1 protein expression, whereas injection of corresponding sense oligonucleotides had no effect on either cPLA2α or ICAM-1 overexpression, indicating that cPLA2α has a major role in upregulating ICAM-1 protein induction during inflammation. The role of cPLA2α in ICAM-1 upregulation was shown by immunohistochemistry staining of ICAM-1 in the mouse joints (Fig. 1B). A significant ICAM-1–positive staining is demonstrated in the vascular endothelial cells in the inflamed joint of mice with CIA compared with joints of healthy control mice. The antisense treatment that caused a significant reduction in cPLA2α upregulation in the inflamed joints of CIA mice (12) caused a significant reduction in ICAM-1–positive staining in the vascular endothelial cells. Of note, the inflammatory cells present in the inflamed joint sections of CIA mice did not express high levels of ICAM-1 and thus probably did not have a significant contribution to the elevated ICAM-1 protein expression detected in these joints by immunoblot (Fig. 1A). In vivo regulation of ICAM-1 induction by cPLA2α in inflammatory sites. A, A mouse model of CIA. A representative immunoblot analysis out of cPLA2α, ICAM-1, and the corresponding β-actin protein expression in paw lysates of healthy controls (H), inflamed paws of CIA mice (CIA), and paws from CIA mice i.v. daily treated with 2 mg/kg AS (CIA+AS) after development of paw inflammation. There was no difference between nontreated CIA mice and CIA mice daily treated with 2 mg/kg sense, and they were included in the CIA group. The intensity of each cPLA2α or ICAM-1 band was divided by the intensity of each β-actin band after quantitation by densitometry, and expressed in the bar graph as arbitrary units. *Significant differences in comparison with noninflamed paw or paw from CIA mice after AS treatment, p < 0.001. B, ICAM-1 immunohistochemistry of synovial sections to demonstrate the localization of increased ICAM-1 expression in mice described in A. Negative control was performed on sections of CIA mice. Original magnification ×200; ×1000 (inset). Representative results out of 10 mice in each group are shown in A and B. C, A mouse model of obesity. A representative immunoblot analysis of cPLA2α, ICAM-1, and the corresponding β-actin protein expression in periepididymal fat tissue lysates from mice at day 3 on LFD, on HFD (nontreated or treated with 2 mg/kg sense that showed identical results), and on HFD daily treated with 2 mg/kg AS. The intensity of the cPLA2α or ICAM-1 bands was determined as in A. *Significant differences in comparison with LFD or HFD after AS treatment, p < 0.001. D, cPLA2α (upper panel) and ICAM-1 (lower panel) immunohistochemistry of periepididymal fat tissue sections to demonstrate the localization of increased cPLA2α and ICAM-1 protein expression in mice described in C. Negative control was performed on sections from mice on an HFD. Original magnification ×400. Representative results out of eight mice in each group are shown in C and D.
The role of cPLA2α on the upregulation of ICAM-1 protein expression was further supported in a mouse model of obesity. In the recent years, obesity is increasingly accepted as a condition characterized by low-grade chronic inflammation (22). Systemically, this is evidenced by elevated levels of various inflammatory markers, including C-reactive protein, TNF-α, and IL-6, and by an activated state of circulating leukocytes (23–25). Periepididymal adipose tissue has become recognized as an important target of inflammatory processes. We recently demonstrated (14) in C57BL/6J mice that early (3 and 7 d) after initiating obesity by an HFD, neutrophils transiently infiltrated the periepididymal adipose tissue. Thus, we first studied whether there is cPLA2α and ICAM-1 overexpression in periepididymal fat tissue in mice on HFD and then determined the role of cPLA2α in upregulation of ICAM-1 in this tissue by i.v. injection of AS. Immunoblot analysis, presented in Fig. 1C, shows that the protein expression of cPLA2α and ICAM-1 were elevated in periepididymal adipose tissue of mice lysates kept for 3 d on an HFD compared with mice fed a normal LFD for 3 d. Intravenous injection of AS (2 mg/kg) 1 d prior and every day during the 3 d of HFD resulted in prevention of both cPLA2α and ICAM-1 overexpression in the periepididymal adipose tissue lysates. The immunohistochemistry staining of cPLA2α and ICAM-1 (Fig. 1D) showed that the positive staining was detected mainly in the endothelial vascular cells derived from fat tissue of HFD mice. The expression of cPLA2α and ICAM-1 protein was much higher in fat tissue of HFD mice compared with that of mice fed a normal diet. AS treatment that inhibited cPLA2α upregulation in fat tissue of mice maintained on an HFD also inhibited ICAM-1 upregulation. Collectively, these results further support the suggestion that cPLA2α upregulates endothelial ICAM-1 protein expression. To determine the role of cPLA2α in ICAM-1 expression in endothelial cells and in the adherence process to inflammatory cells, we used the ECV-304 cell line. ECV-304 is a spontaneously transformed line derived from Japanese HUVEC culture. The ECV-304 cell line was selected to study ICAM-1, because in those cells, ICAM-1 is the only adhesion molecule constitutively expressed and is upregulated by TNF-α (26). In contrast, the parent line, HUVEC, constitutively expresses low levels of both ICAM-1 and PECAM-1 and is upregulated by cytokines, whereas the expression of VCAM-1 and E-selectin is induced by cytokines. Inflammatory cells, neutrophils, and monocytes were found to tightly adhere to ECV-304 (27–30). To investigate a putative role of endothelial cPLA2α in TNF-α–induced ICAM-1 expression, we used the antisense technology to prevent cPLA2α upregulation by TNF-α. ECV-304 cells were incubated with 1 μM AS or the correspondence sense for 24 h before addition of 10 ng/ml TNF-α for 24 h. To detect ICAM-1 protein expression, we used two approaches: 1) Western blotting of ICAM-1 in endothelial lysates; and 2) ICAM-1 plasma membrane surface expression by FACS analysis. As shown in Fig. 2A, preincubation with AS caused a significant reduction in cPLA2α protein expression and prevention of cPLA2α upregulation induced by TNF-α, whereas sense had no effect. Consistent with cPLA2α protein expression, cPLA2α activity was elevated ∼2-fold by TNF-α, and this increased activity was prevented in the presence of AS but not sense (Fig. 2B). Under these experimental conditions, the expression of ICAM-1 detected in cell lysates or membrane surface expression (Fig. 2C, 2D) coincided with the expression of cPLA2α, it was reduced in ECV-304 cells in the presence of AS, and its upregulation induced by TNF-α was prevented. The presence of the corresponding sense that did not inhibit cPLA2α upregulation (Fig. 2A, 2B) had no effect on ICAM-1 protein expression in the absence or presence of TNF-α (Fig. 2C, 2D). These in vitro results are consistent with the in vivo results (Fig. 1) and suggest that cPLA2α regulates ICAM-1 protein synthesis under inflammatory conditions. In vitro regulation of ICAM-1 expression by cPLA2α in ECV-304 cells. A, Preincubation with AS efficiently inhibited cPLA2α expression in endothelial ECV-304 cells. A representative immunoblot analysis of cPLA2α and the corresponding β-actin protein expression in ECV-304 cells preincubated for 24 h with 1 μM antisense or sense (SE) before addition of 10 ng/ml TNF-α for additional 24 h. Quantitation of three independent experiments is presented, expressed in the bar graph, and was performed as described in Fig. 1A. B, Preincubation with AS efficiently inhibited cPLA2α sp. act. in ECV-304 cells. The cells were treated as in A, and the release of labeled AA from labeled phosphatidylcholine (PC) vesicles was measured in cell lysates. The results are the mean ± SEM from three independent experiments. *Significant reduction by AS treatment, p < 0.001; **significant upregulation in the presence of TNF-α compared with its absence, p < 0.001. C and D, The effect of inhibition of cPLA2α protein expression on ICAM-1 protein expression. A representative immunoblot analysis of ICAM-1 and of the corresponding β-actin protein expression (C) and the mean ± SEM of ICAM-1 surface expression detected by FACS analysis from three independent experiments (D) in cells treated as in A. Significance as in B. E and F, The role of endothelial cPLA2α on adherence to phagocytes. Neutrophil- or monocyte-like PLB cells were stimulated with PMA (50 ng/ml) for 5 min prior to their addition to ECV-304 cells untreated or pretreated with AS or correspondence sense (SE) in the presence and absence of TNF-α for 24 h as in A. Adherence was determined as described in the Materials and Methods, and the mean ± SE of three independent experiments was expressed as the percentage of differentiated PLB cells that adhered to ECV-304 cells (% Adhesion). The presence of TNF-α increased the adherence in each treatment (p < 0.05). *Significant reduced adherence to stimulated phagocyte-like cells by AS treatment, p < 0.001; **significant increased adherence to stimulated phagocyte-like cells by PMA, p < 0.001. Then, the effect of reduction in cPLA2α protein expression on the functional ability of ICAM-1 to adhere to phagocytes was studied. To avoid the variability seen in peripheral blood neutrophils from different volunteers, we used differentiated PLB cells. Differentiated PLB cells were pretreated for 5 min with PMA before their addition to ECV-304 cells to increase the surface expression of CD11b, the counterpartner for ICAM-1. As shown in Fig. 2E and 2F, there was a detectable adherence of ECV-304 cells to granulocyte- and monocyte-like PLB cells that was significantly (p < 0.001) higher with PMA-stimulated differentiated PLB cells. Whereas monocyte-like PLB cells but not granulocyte-like PLB cells express FcγRIIA, both types of differentiated cells express similar levels of CD11b. The similar adherence of both types of differentiated cells support the specificity of the process. Pretreatment of ECV-304 cells with TNF-α caused a significant (p < 0.05) increase in the adherence to differentiated PLB cells. AS treatment that reduced cPLA2α and ICAM-1 protein expression in ECV-304 cells (Fig. 2C, 2D) also decreased their adherence to neutrophil- and monocyte-like PLB cells (Fig. 2E, 2F). In our previous studies, we have shown that cPLA2α exerts its effect on gene expression and protein upregulation in the leukemic PLB cells (18) and in primary rat microglia (19, 31) via the production of PGE2. To study whether PGE2 is involved in TNF-α–induced ICAM-1 upregulation in endothelial ECV-304 cells, we first studied the secretion of PGE2 induced by TNF-α during 24 h. As shown in Fig. 3A, there is a significant increase in PGE2 secretion detected from 8 h of incubation with TNF-α that was blocked in the presence of AS. The significant inhibitory effect of AS suggests that cPLA2α is the isozyme responsible for PGE2 production in ECV-304 cells. Four different EP receptors have been identified, each of which signals a different pathway in various cell types (10). To explore which pathway is initiated by PGE2 in the induction of ICAM-1 protein, the expression of these four EPs was examined by RT-PCR using specific primers. As demonstrated in Fig. 3B, EP3 and EP4 receptor mRNA were significantly expressed in ECV-304 cells, whereas EP1 and EP2 receptor mRNA were not detected. To study the role of PGE2 in ICAM-1 protein expression, the production of PGE2 was inhibited by a COX inhibitor, indomethacin. Addition of 30 μM indomethacin to the ECV-304 cells for 24 h caused a significant reduction in ICAM-1 expression in total cell lysates (Fig. 3C) and in ICAM-1 membrane surface expression (Fig. 3D) in the presence and absence of TNF-α. The presence of PGE2 (15 μM) significantly restored the reduced ICAM-1 protein expression in the presence of indomethacin in TNF-α–treated cells (Fig. 3C, 3D), further supporting a role of PGE2 in ICAM-1 upregulation. PGE2 by itself (in the absence of TNF-α) did not induce ICAM-1 protein expression, indicating that it is required but not sufficient for this process. The similar inhibitory effect caused by the presence of indomethacin (Fig. 3C, 3D) and of AS (Fig. 2C, 2D) on ICAM-1 expression strengthen the view that cPLA2α is the isozyme responsible for PGE2 production in these cells. It was reported that cPLA2α regulates COX-2 expression in a mouse model of cPLA2α knockout, though through a yet-unknown mechanism (32). Thus, the time dependency of TNF-α triggered cPLA2α activation and upregulation, and COX-2 and ICAM-1 protein induction were determined. As shown in Fig. 3E, cPLA2α was significantly activated, as evidenced by its phosphorylation on Ser505, detected already at the first time point assayed, 1 h, whereas a significant upregulation of cPLA2α protein expression was detected at 24 h. The appearance of COX-2 protein at 8 h of stimulation with TNF-α coincided with the time-dependent release of PGE2 (Fig. 3A). As shown in Fig. 3E, ICAM-1 protein was detectable at 12 h of TNF-α stimulation. The presence of AS 24 h prior to addition of TNF-α significantly reduced cPLA2α protein expression and, as a result, its phosphorylated form at all time points studied. In addition, the presence of AS (Fig. 3E) prevented COX-2 upregulation, consistent with the inhibition of PGE2 secretion (Fig. 3A) and the inhibition of ICAM-1 upregulation (Fig. 2C, 2D). Involvement of PGE2 in TNF-α induction of ICAM-1 upregulation. A, PGE2 secretion. Time-course release of PGE2 during 24 h of exposure of ECV-304 to TNF-α (with and without pretreatment with 1 μM AS). The mean ± SE of three independent experiments is presented. B, EP mRNA. Representative RT-PCR analysis of EP mRNA in cells treated with TNF-α for 24 h. Three other experiments showed similar results. C and D, Preincubation with 30 μM indomethacin (Indo) caused inhibition of ICAM-1 protein expression and ICAM-1 cell-surface exposure in the presence or absence of TNF-α for 24 h. The presence of 15 μM PGE2 restored the reduced ICAM-1 protein expression and ICAM-1 cell-surface expression by indomethacin in cells exposed to TNF-α. A representative experiment out of three is presented. Quantitation of ICAM-1 presented by bar graphs was determined as in Fig. 1A and expressed as arbitrary units. The results presented in D are the mean ± SEM from three independent experiments. E, Time-dependent activation of cPLA2α and induction of cPLA2α, COX-2, and ICAM-1 protein expression, all inhibited by the pretreatment with 1 μM AS for 24 h before addition of TNF-α. Shown are representative immunoblots out of three independent experiments. cPLA2α activation as detected by its phosphorylation on Ser505 was determined by dividing the intensity of each phospho-cPLA2α by the intensity of each corresponding cPLA2α band after quantitation by densitometry and expressed in the bar graph as arbitrary units. Quantitation of COX-2 and ICAM-1 presented by bar graphs was determined as in Fig. 1A and expressed as arbitrary units. *Significant reduction by indomethacin, p < 0.001; **significant ICAM-1 upregulation in the presence of TNF-α and by restoration with PGE2 in the presence of indomethacin, p < 0.001. Because activation of EP4 has been shown to activate protein kinase A (PKA) (10), we studied the involvement of PKA in the signaling events leading to induction of ICAM-1, using H-89, a PKA inhibitor. H-89, in the range of 2.5–20 μM, caused a dose-dependent inhibition of TNF-α–induced ICAM-1 upregulation in total cell lysates and membrane surface expression (Fig. 4A, 4B) Furthermore, the reduced expression of ICAM-1 in the presence of indomethacin in cells treated with TNF-α could be restored by addition of 10 μM dibutyryl cAMP (dbcAMP) (Fig. 4C, 4D), a cAMP analog that directly activates PKA. As shown for PGE2 (Fig. 3D), addition of dbcAMP (in the absence of TNF-α) did not induce ICAM-1 protein expression, suggesting that PKA activation is required but not sufficient for this process. Involvement of PKA in TNF-α induction of ICAM-1 upregulation. A and B, The dose-dependent effect of a PKA inhibitor, H-89, on ICAM-1 expression induced by TNF-α. A representative immunoblot analysis of ICAM-1 and of the corresponding β-actin protein expression in cell lysates. Quantitation of ICAM-1 presented by bar graphs was determined as in Fig. 1A and expressed as arbitrary units. ICAM-1 surface expression detected by FACS analysis presented in B is representative of three different experiments. C and D, The inhibited ICAM-1 protein expression and ICAM-1 cell-surface exposure in cells pretreated with 30 μM indomethacin and stimulated by TNF-α was restored by the presence of 0.3 mM dbcAMP. A representative immunoblot analysis of ICAM-1 and of the corresponding β-actin protein expression. Quantitation of ICAM-1 presented by bar graphs was determined as in Fig. 1A and expressed as arbitrary units. The results presented in D are mean ± SEM of ICAM-1 surface expression detected by FACS analysis in three experiments. *Significant reduction by indomethacin, p < 0.001; **significant ICAM-1 upregulation in the presence of TNF-α and by restoration with dbcAMP in the presence of indomethacin and TNF-α, p < 0.001. Oxidative signals play an important role in the regulation of inflammatory gene expression in endothelial cells (33). To study whether superoxides are involved in ICAM-1 upregulation by TNF-α and to determine their putative role in the signal transduction of ICAM-1 protein induction, we first assayed the effect of TNF-α on superoxide generation. As shown in Fig. 5A, TNF-α caused an immediate and significant release of superoxide as determined by DHE reduction, which was totally inhibited in the presence of diphenylene iodonium (DPI) (10 μM). Because our previous studies have shown that cPLA2α regulates the NAD(P)H oxidase 2 (NOX2)-NADPH oxidase in phagocytic cells (12, 16), we studied whether cPLA2α regulates NOX4-NADPH oxidase present in endothelial ECV-304 cells (34). Preincubation of endothelial cells with AS that inhibited cPLA2α expression did not affect superoxide production triggered by TNF-α (Fig. 5B), indicating that NOX4-NADPH oxidase is not regulated by cPLA2α. Moreover, activation of cPLA2α determined by its phosphorylation detected as early as 10 min of exposure to TNF-α was inhibited in the presence of DPI (Fig. 5C), indicating that cPLA2α activation is regulated by NOX4-NADPH oxidase in endothelial cells. To support this view, the effect of DPI on the release of PGE2 by TNF-α was determined. As shown in Fig. 5D, DPI caused a total inhibition of the time-dependent PGE2 secretion induced by TNF-α, which was identical to that caused by inhibition of cPLA2α by means of AS (Fig. 3A). To further determine the role of superoxides in the signal events leading to ICAM-1 protein induction, the effect of DPI was studied on the time-dependent effect of TNF-α on cPLA2α activation and protein expression in relation to COX-2 and ICAM-1 upregulation. As shown in Fig. 5E, the presence of DPI, similar to the effect of AS (Fig. 3E), inhibited the phosphorylation of cPLA2α during the 24 h studied, inhibited cPLA2α upregulation at 24 h, and prevented the induction of COX-2 and ICAM-1 protein expression. These results support the view that the activation of NADPH oxidase is upstream to cPLA2α, and its inhibition attenuates cPLA2α activity. The role of endothelial NADPH oxidase in ICAM-1 upregulation by TNF-α. A, DPI-sensitive superoxide production induced by TNF-α in ECV-304 cells measured by the reduction of DHE. DPI (10 μM) was added 5 min prior to addition of TNF-α. B, Superoxide production induced by TNF-α in ECV-304 cells was not affected by preincubation with 1 μM AS or sense for 24 h. C, cPLA2α activation was inhibited in the presence of DPI (10 μM) as detected by phospho-cPLA2α on Ser505. A representative immunoblot out of three is shown. The intensity of each phospho-cPLA2 was divided by the intensity of each corresponding cPLA2α band after quantitation by densitometry and expressed in the bar graph as arbitrary units. D, The time-dependent release of PGE2 by TNF-α was inhibited in the presence of 10 μM DPI added 5 min prior to TNF-α. The mean ± SE of three independent experiments is presented. E, Time-dependent activation of cPLA2α and induction of cPLA2α, COX-2, and ICAM-1 protein expression, all inhibited by the presence of DPI (10 μM) added 5 min prior to TNF-α. Shown are representative immunoblots out of three independent experiments. cPLA2α activation as detected by its phosphorylation on Ser505 was determined by dividing the intensity of each phospho-cPLA2α by the intensity of each corresponding cPLA2α band after quantitation by densitometry and expressed in the bar graph as arbitrary units. Quantitation of COX-2 and ICAM-1 presented by bar graphs was determined as in Fig. 1A and expressed as arbitrary units. It has been shown that PKA can phosphorylate NF CREB for its binding to cAMP response elements (CRE) (35). In addition, PKA has been reported to phosphorylate the p-65 subunit of dimeric NF-κB (36), leading to NF-κB binding response element in gene promoters. ICAM-1 gene promoters contain several NF-κB response elements (37). Moreover, it was reported that NF-κB is bound to ICAM-1 promoter and is crucial for the induction of ICAM-1 (5). Because our results suggested that PGE2 stimulates the PKA pathway, we speculated that CREB also participates in the induction of ICAM-1. Indeed, using the TF-search program, we found a single nuclear CREB site in the ICAM-1 gene promoter (38), extending between 2234 and 2246 bp. To determine the relative role of each transcription factor, NF-κB and CREB, in ICAM-1 transcription, their activation and translocation to the nuclear fraction by TNF-α were analyzed. The phosphorylation of p65–NF-κB on Ser536 and Ser273 and of CREB on Ser133 in nuclear extract of ECV-304 cells treated with TNF-α was determined. A detailed time-dependent phosphorylation of p65–NF-κB revealed that p65 was phosphorylated on Ser536, but not on Ser273, and detected at 1 h and at 8–10 h, whereas phosphorylated CREB was detected at 10 h only (Fig. 6A). To study the role of cPLA2α and PKA on these phosphorylation events, the cells were preincubated with 1 μM AS or 10 μM PKA inhibitor (H-89) before addition of 10 ng/ml TNF-α for 1 or 10 h (Fig. 6B). Preincubation with AS inhibited the presence of phospho-p65 NF-κB at both 1 and 10 h and of phospho-CREB detected at 10 h, indicating that cPLA2α is involved in both the early and late phosphorylation events of p65 and in the phosphorylation of CREB. The presence of H-89 inhibited the phosphorylation of CREB, as expected, and the phosphorylation of p65 at 10 h but not at 1 h, suggesting that the late phosphorylation of p65 may be mediated also by a PKA-dependent process. Inhibition of NADPH oxidase activity by either DPI or apocynin prevented p65 phosphorylation at 1 h and 10 h and CREB phosphorylation at 10 h (Fig. 6C), similar to the effect of the AS (Fig. 6B). To study which event of NF-κB activation is involved in the signal transduction of ICAM-1 induction (the early at 1 h or the late at 10 h), the NADPH oxidase inhibitor was added at 2 h of activation with TNF-α after termination of the first event of p65 phosphorylation (Fig. 6A). As shown in Fig. 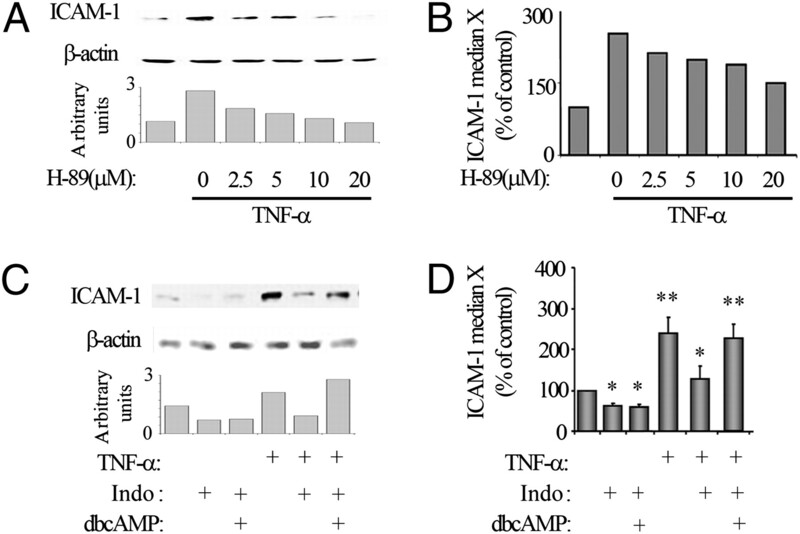 6D, inhibition of the second event of NF-κB by DPI did not affect ICAM-1 expression or COX-2 upregulation, indicating that only the first event related to p65–NF-κB activation is involved in the signaling of ICAM-1 expression but not a p65 phosphorylation event at 10 h. Interestingly, although inhibition of the first event of p65 phosphorylation by DPI (Fig. 6C) inhibited COX-2 upregulation, CREB phosphorylation, and ICAM-1 expression, addition of DPI at 2 h of stimulation, after termination, the first event of phosphorylation caused inhibition of the second event of p65 phosphorylation but had no effect on CREB phosphorylation (Fig. 6D), suggesting that the early p65 phosphorylation is required for COX-2 upregulation and CREB phosphorylation occurring at 10 h of TNF-α stimulation and required for ICAM-1 upregulation. Involvement of CREB and NF-κB in the induction of ICAM-1 upregulation induced by TNF-α in ECV-304 cells. A, Time-dependent activation of p65–NF-κB was analyzed using specific Abs against phospho-p65 on Ser273 or Ser536 (p-P65 273 or p-P65 536) and the expression p65 protein in nuclear lysates. Time-dependent activation of CREB was analyzed using specific Abs against phospho-CREB on Ser133 and CREB expression in nuclear lysates. B, The effect of cPLA2α or PKA inhibition on p65–NF-κB and CREB phosphorylation by TNF-α in nuclear lysates. Cell were preincubated with 1 μM AS or 20 μM H89 for 24 h before addition of TNF-α for 1 or 10 h. The intensity of each phospho-p65 (p-P65) or phospho-CREB band was divided by the intensity of each lamin band after quantitation by densitometry and expressed as arbitrary units. C, The effect of NADPH oxidase inhibition on p65–NF-κB (p-P65) and CREB phosphorylation by TNF-α in nuclear lysates. Total of 10 μM DPI or 10 μM apocinine (APO) were added 5 min prior to addition of TNF-α for 1 or 10 h . Quantitation of phospho-p65 and phospho-CREB as in B. D, The role of the first NF-κB activation for ICAM-1 upregulation by TNF. The effect of cPLA2α or PKA inhibition on p65 and CREB activation by TNF-α. DPI (10 μM) was added 2 h after addition of TNF-α. phospho-p65 on Ser536 (p-P65) at 1 and 10 h and phospho-CREB at 10 h were determined in nuclear lysates and quantitated as in B. ICAM-1 protein expression in cell lysates was determined and quantitated in relation to its actin as described in Fig. 1A. E, CREB phosphorylation is not sufficient to induce ICAM-1 induction. Cells were preincubated with 1 μM AS or 20 μM H89 for 24 h before addition of TNF-α for 10 or 24 h. Where indicated, 15 μM PGE2 was added to the cells. phospho-p65 (p-P65) and phospho-CREB at 10 h were determined in nuclear lysates and quantitated as in B. ICAM-1 protein expression at 24 h was determined in cell lysates and quantitated in relation to its actin as described in Fig. 1A. A–E, Shown is a representative experiment out of three independent experiments that gave similar results. To study whether the activation of CREB in the absence of NF-κB activation is sufficient to induce ICAM-1 upregulation, PGE2 was added to cells pretreated with the AS and stimulated with TNF-α. As shown in Fig. 6E, under these conditions, only CREB but not NF-κB was phosphorylated, but this phosphorylation was not sufficient for ICAM-1 induction. The role of cPLA2α in the induction of the adhesion molecules was documented also in primary endothelial cells, HUVEC, that can express both ICAM-1 and VCAM-1. As shown in Fig. 7A, preincubation with AS caused a significant reduction in cPLA2α protein expression and prevention of cPLA2α upregulation induced by TNF-α, whereas sense had no effect. cPLA2α activity was elevated ∼2-fold by TNF-α, and this increased activity was prevented in the presence of AS but not sense (Fig. 7B). Addition of TNF-α induced a robust upregulation of ICAM-1 (Fig. 7C, 7D) compared with that induced in the ECV-304 cell line (Fig. 2C, 2D) and of VCAM-1 proteins, whereas the presence of AS reduced their protein expression. Addition of the corresponding sense that did not inhibit cPLA2α upregulation (Fig. 7A) had no effect on ICAM-1 or VCAM-1 protein expression (Fig. 7C, 7D). The presence of DPI caused inhibition of both ICAM-1 and VCAM-1 induction by TNF-α in HUVEC (Fig. 7C, 7D). The reduction in ICAM-1 and VCAM-1 protein expression in HUVEC in the presence of AS resulted with attenuation of the adherence to granulocyte- and monocyte-PLB cells (Fig. 7E). The time-course effect of TNF-α on cPLA2α activation and upregulation as well as on COX-2, ICAM-1, and VCAM-1 upregulation in HUVEC cells is presented in Fig. 7F. Similar to ECV-304 cells (Fig. 3E), cPLA2α activation determined by its phosphorylation on Ser505 was detected in HUVEC already at the first time point assayed, 1 h, whereas a significant upregulation of cPLA2α protein expression was detected at 12 h. COX-2 protein was detected at 8 h of stimulation with TNF-α, whereas ICAM-1 and VCAM-1 proteins were detected at 10 h and 12 h, respectively. The presence of AS 24 h prior to addition of TNF-α significantly reduced cPLA2α protein expression and, as a result, its phosphorylated form at all time points studied. The presence of AS prevented COX-2 as well as ICAM-1 and VCAM-1 upregulation. In vitro regulation of ICAM-1 and VCAM-1 expression by cPLA2α in HUVEC. The experiments were conducted in both commercial HUVEC and isolated from human umbilical cord and gave identical results. A, Preincubation with AS efficiently inhibited cPLA2α expression in HUVEC. A representative immunoblot analysis of cPLA2α and the corresponding β-actin protein expression in cells preincubated for 24 h with 1 μM antisense or sense (SE) before addition of 10 ng/ml TNF-α for additional 24 h. Quantitation of four independent experiments is presented, expressed in the bar graph, and was performed as described in Fig. 1A. B, Preincubation with AS efficiently inhibited cPLA2α sp. act. in HUVEC. The cells were treated as in A, and the release of labeled AA from labeled PC vesicles was measured in cell lysates. The results are the mean ± SEM from four independent experiments. *Significant reduction by AS treatment, p < 0.001; **significant upregulation in the presence of TNF-α compared with its absence, p < 0.001. C and D, The effect of inhibition of cPLA2α activity and of superoxide production on ICAM-1 and VCAM-1 protein expression. A representative immunoblot analysis of ICAM-1 of VCAM-1 and of the corresponding β-actin protein expression and quantitation of three independent experiments are expressed in the bar graph (C) and the mean ± SEM of ICAM-1 and VCAM-1 surface expression detected by FACS analysis from three independent experiments (D) in cells treated as in A. Significance as in B. E, The role of endothelial cPLA2α on adherence to phagocytes. Neutrophil- or monocyte-like PLB cells were stimulated with PMA (50 ng/ml) for 5 min prior to their addition to HUVEC cells untreated or pretreated with AS or correspondence sense (SE) in the presence and absence of TNF-α for 24 h as in A. Adherence was determined as described in the Materials and Methods and expressed as the percent of differentiated PLB cells that adhered to HUVEC (% Adhesion). The results are the mean ± SEM from four independent experiments. The presence of TNF-α increased the adherence in each treatment (p < 0.05). The adherence was undetectable in the absence of TNF-α. F, Time-dependent activation of cPLA2α and induction of cPLA2α, COX-2, ICAM-1, and VCAM-1 protein expression—all were inhibited by the pretreatment with 1 μM AS for 24 h before addition of TNF-α. Shown are representative immunoblots out of three independent experiments that gave similar results. cPLA2α activation as detected by its phosphorylation on Ser505 was determined by dividing the intensity of each phospho-cPLA2α by the intensity of each corresponding cPLA2α band after quantitation by densitometry. Quantitation of COX-2, ICAM-1, and VCAM-1 presented in bar graphs was determined as in Fig. 1A. The counter partner of endothelial ICAM-1 is the phagocyte CD11b. To study the role of phagocyte cPLA2α on the adherence process to endothelial cells, its activity was inhibited by AS. Addition of 1 μM AS at the third day of differentiation to either granulocyte- or monocyte-like cells for 24 h caused a significant inhibition in cPLA2α expression (Fig. 8A) and sp. act. in unstimulated cells (Fig. 8B). Pretreatment with AS reduced superoxide production (Fig. 8C), but did not change the surface expression of CD11b in differentiated PLB cells before and after stimulation with PMA (Fig. 8D) nor their adherence to ECV-304 cells (Fig. 8E). 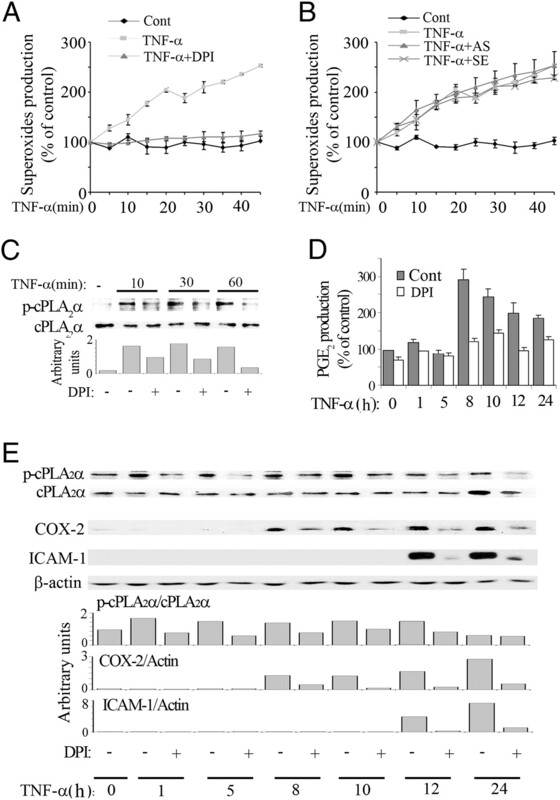 These results suggest that phagocyte cPLA2α and the NOX2-NADPH oxidase are not involved in regulation of ICAM-1 protein induction, in contrast to endothelial cPLA2α and NOX4-NADPH oxidase that regulate ICAM-1 upregulation and thus the adherence process. The results of the current study are in accordance with our earlier study (14) that demonstrated that inhibition of NADPH oxidase in mouse neutrophils did not affect CD11b cell exposure and their adherence to adipocytes. Phagocyte cPLA2α does not regulate CD11b expression and adherence. A, Preincubation with AS efficiently inhibited cPLA2α expression in differentiated PLB cells. 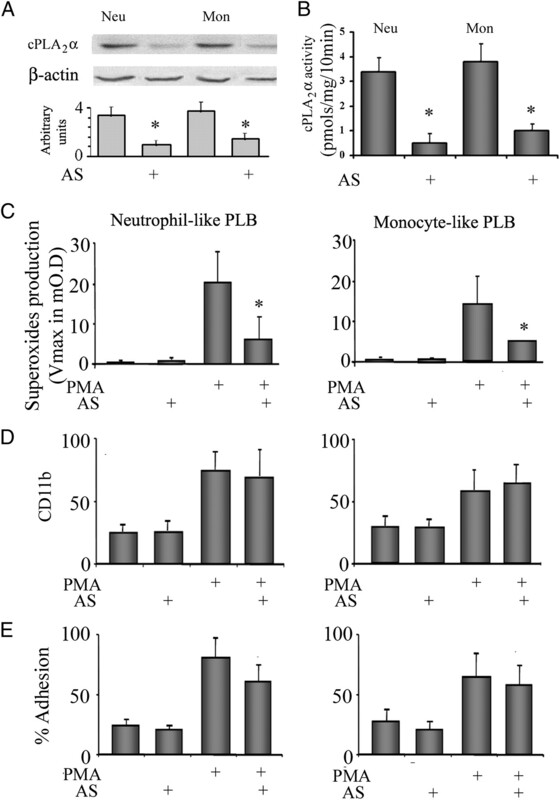 A representative immunoblot analysis of cPLA2α and the corresponding β-actin protein expression after preincubation with or without 1 μM AS in neutrophil (Neu)- or monocyte (Mon)-like PLB cells (preincubation with the corresponding sense was similar to untreated cells, not shown). Quantitation of three independent experiments expressed in the bar graph was performed as described in Fig. 1A. B, Preincubation with AS efficiently inhibited cPLA2α sp. act. in differentiated PLB-985 cells. The cells were treated as in A, and the release of labeled AA from labeled PC vesicles was measured in cell lysates. C, Inhibition of superoxide production stimulated by 50 ng/ml PMA in differentiated PLB cells by preincubation with AS. D, Preincubation with AS (as in A) did not affect CD11b surface exposure in differentiated PLB cells stimulated by 50 ng/ml PMA. E, The presence of AS did not affect the number of adherent differentiated PLB cells (% Adhesion) in the presence or absence of 50 ng/ml PMA to ECV-304 cells. The results presented in C–E are the mean ± SEM from same three independent experiments. *Significant reduction by AS treatment, p < 0.001. The results of the current study demonstrate that cPLA2α has a central role in ICAM-1 overexpression during inflammation both in in vivo and in vitro systems. As shown in Fig. 1, ICAM-1 upregulation in the inflamed paws of CIA mice and in periepididymal adipose tissue in mice fed an HFD coincided with the elevated cPLA2α protein expression, and prevention of cPLA2α upregulation, by i.v. injection of AS against cPLA2α, in inflamed tissues in both mouse models resulted in prevention of ICAM-1 overexpression. The immunohistochemistry analysis of the periepididymal adipose of mice kept on an HFD diet showed elevated cPLA2α and ICAM-1 protein expression mainly on the vascular cell membranes that were significantly lower in mice treated with AS. The inhibition of the elevated ICAM-1 protein expression in the vascular endothelial cell membranes is the inflamed joints of CIA mice by the AS treatment further demonstrates the significant role of cPLA2α in ICAM-1 upregulation during inflammation. In our previous study in DBA mice with CIA (12), we have demonstrated the i.v. administration of AS that reduced cPLA2α protein expression in inflamed paws also inhibited the recruitment of neutrophils to the inflamed site through cPLA2α-dependent LTB4 production. The present study suggests that cPLA2α may also control neutrophil recruitment by an additional mechanism (i.e., regulating ICAM-1 protein induction). The role of cPLA2α in the transduction events leading to induction of ICAM -1 protein expression was elucidated in the endothelial cell line, ECV-304, that expresses only this adhesion molecule and documented in HUVEC for both ICAM-1 and VCAM-1. Similar to the results in the in vivo models, AS against cPLA2α that efficiently prevented TNF-α–induced increase in cPLA2α expression and activity (Figs. 2A, 2B, 7A, 7B) also prevented the induction of ICAM-1 protein in ECV-304 cells (Fig. 2C, 2D) and both adhesion molecules in HUVEC (Fig. 7C, 7D). The role of cPLA2α in VCAM-1 upregulation shown in HUVEC suggests that cPLA2α may serve as a target not only for treatment of inflammation but also as a target for intervention in atherosclerosis. The involvement of various PLA2s in ICAM-1 expression in in vitro systems was reported in earlier studies (39, 40), although understanding the molecular events has not yet been elucidated. In addition to the reported involvement of NF-κB in TNF-α induction of ICAM-1 and VCAM-1 upregulation (5, 6), to our knowledge the results of the current study are the first to demonstrate that CREB transcription factors are also required for ICAM-1 upregulation and that both transcription factors are regulated by cPLA2α. We report in this study that ICAM-1 gene promoter contains a single CRE binding domain, extending between 2234 and 2246 bp. Although VCAM-1 gene promoter does not contain a CRE binding domain, it was reported that inhibition of CREB signaling by overexpression of a dominant-negative form of CREB suppresses TNF-α–induced VCAM-1 in bovine aortic endothelial cells (41). The presence of the AS against cPLA2α that inhibited cPLA2α overexpression and activity and the induction of ICAM-1 protein upregulation in ECV-304 cells (Fig. 2A–D) also inhibited the activation of both transcription factors NF-κB and CREB, as determined by their phosphorylated forms in the nuclear fraction (Fig. 6B). As shown previously, CREB transcription factor undergoes activation by PKA-dependent phosphorylation on Ser133 (42), whereas p65 NF-κB RelA is phosphorylated by PKA on Ser276 (42, 43) or by a redox-sensitive mechanism on Ser536 (44–46). The present study demonstrates a PKA-dependent phosphorylation of CREB on Ser133 at 10 h and two events of phosphorylation of p65 NF-κB on Ser536 at 1 h and 8–10 h of TNF-α exposure, whereas phosphorylation of p65 NF-κB Ser276 was not detected under these conditions, suggesting that PKA is not involved in NF-κB activation. Only the first event of p65 NF-κB phosphorylation is required for the induction of ICAM-1, as its inhibition by addition of NADPH oxidase inhibitors (DPI or apocinin) or cPLA2α inhibitor (AS) prior to exposure to TNF-α prevented the induction of ICAM-1, whereas inhibition of the second phosphorylation event by addition of DPI at 2 h of stimulation with TNF-α, after the termination of the first phosphorylation event, did not affect ICAM-1 expression (Fig. 6D). The sensitivity of p65 NF-κB phosphorylation on Ser536 to DPI or apocinin could suggest that activation of NF-κB is mediated by NADPH oxidase-producing superoxides as suggested previously (45). However, in the presence of AS against cPLA2α, superoxides were produced normally (Fig. 5B), yet the phosphorylation of p65 NF-κB on Ser536 was inhibited (Fig. 6B), indicating that NF-κB phosphorylation is not mediated directly by superoxides. Because cPLA2α was found to be activated by superoxide production as it was sensitive to DPI (Fig. 5C, 5E), it is possible that the phosphorylation of NF-κB is mediated by cPLA2α and thus can be prevented either in the presence of AS or DPI, as both reduce cPLA2α activity, although the kinase involved in this phosphorylation process is not yet identified. In accordance with our suggestion, it was reported (40) that LTB4 produced AA released by cPLA2 is secreted and induces cPLA2α phosphorylation through leukotriene receptors resulting in NF-κB activation via an yet unknown mechanism. Our present study suggests that the cPLA2α-dependent AA metabolite that regulates ICAM-1 expression is PGE2. The presence of AS or DPI, which inhibited cPLA2α upregulation and activation (Figs. 2A, 2B, 5C, 5E), inhibited the release of PGE2 detected 8 h after addition of TNF-α (Figs. 3A, 5D) and the induction of ICAM-1 protein expression (Figs. 2C, 2D, 3E, 5E). Likewise, the presence of a COX inhibitor, indomethacin, that inhibits PGE2 secretion (Fig. 3A) inhibited ICAM-1 upregulation by TNF-α (Fig. 3C, 3D). This inhibition was resorted by addition of PGE2, probably by activation of PKA. The suggestion that PKA pathway participates in signaling ICAM-1 induction is supported by the expression of EP4 (Fig. 3B), the inhibition of ICAM-1 induction by a specific PKA inhibitor (Fig. 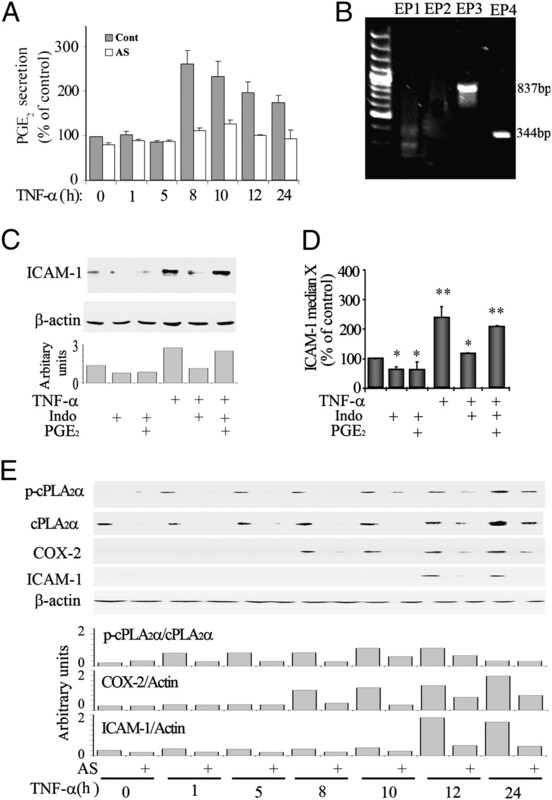 4A, 4B), and the restoration of the inhibited ICAM-1 protein expression in cells pretreated with indomethacin by a cAMP analog (Fig. 4C, 4D), which directly activates PKA. The participation of PKA in ICAM-1 production is in accordance with a previous study in HUVEC (47). The results of the current study shown in Fig. 6 are in agreement with the known role of CREB stimulation by PKA in cAMP-mediated activation of gene transcription (48). CREB phosphorylation on Ser133 was PKA dependent (Fig. 6B), and it was obligatory for ICAM-1 upregulation by TNF-α (Fig. 4A, 4B). However, activation of CREB is not sufficient to induce ICAM-1, as PGE2 could not restore the inhibited ICAM-1 upregulation caused by the presence of either AS (Fig. 6E) or DPI (not shown) that inhibited the first event of NF-κB activation. Likewise, as shown in Figs. 3C, 3D, 4C, and 4D, there was no induction of ICAM-1 by addition of PGE2 or dbcAMP (both known to phosphorylate CREB) in the absence of TNF-α. These results suggest that CREB phosphorylation, although required, is not sufficient for ICAM-1 induction, and the first event of NF-κB activation is also necessary. The inhibition of CREB phosphorylation in the presence of DPI or AS in cells stimulated with TNF-α (Fig. 6C) raises the possibility that the first phosphorylation event of p65–NF-κB on Ser536 is required for the phosphorylation of CREB, in addition to its role in activation of ICAM-1 promoter (5, 6). Thus, it might possibly be that the activation of NF-κB at 1 h that is dependent on cPLA2α, as is inhibited in the presence of AS (Fig. 3B), is also required for COX-2 induction and responsible for the elevated release of PGE2 that in turn phosphorylates CREB through activation of PKA. The time-dependent formation of COX-2 and PGE2 release at 8 h, CREB phosphorylation at 10 h, and ICAM-1 upregulation at 24 h of TNF-α stimulation and their inhibition in the presence of DPI or AS that inhibits the first NF-κB activation support this suggestion. The mechanism by which cPLA2α regulates COX-2 upregulation is not yet clear. However, it was reported (49) that COX-2 induction in smooth muscle cells is mediated by the CRE through an autocrine loop involving endogenous PGE2 produced by COX-1 using AA liberated by cPLA2α. In conclusion, the current study demonstrates, as summarized in Fig. 9, that addition of TNF-α to endothelial cells stimulates the production of superoxides probably by NOX4-NADPH oxidase that causes cPLA2α activation detected as early as 10 min. cPLA2α is involved in the first event of NF-κB activation required for ICAM-1 induction, at 1 h of TNF-α stimulation. cPLA2α inhibition by means of AS did not affect the normal production of superoxides by NOX4-NADPH oxidase triggered by TNF-α, yet NF-κB phosphorylation and ICAM-1 upregulation were attenuated, suggesting that superoxides do not directly activate NF-κB but do so through cPLA2α. cPLA2α is also involved in a later stage of ICAM-1 induction, by liberating AA and by regulating the COX-2 protein induction (Fig. 3D). At 8 h of TNF-α stimulation, there is a significant release of PGE2, which coincided with the protein expression of COX-2 (both inhibited in the presence of AS). The activation of PKA by PGE2 through EP4 stimulates CREB phosphorylation on Ser133. Phosphorylated CREB is required but is not sufficient for ICAM-1 induction. p65 NF-κB phosphorylation on Ser536 probably participates in ICAM-1 promoter activation as reported before. However, this event is not sufficient to induce ICAM-1 upregulation, as in its presence and the absence of CREB activation, by a PKA inhibitor, there is no induction of ICAM-1. Thus, we suggest that two sequential cPLA2α-dependent synchronized activation processes of two transcription factors NF-κB and CREB participate in upregulation of ICAM-1 expression. Proposed schematic signaling pathways for the involvement of NF-κB and CREB, both under cPLA2α regulation, activation in the induction of ICAM-1 protein expression (detailed in the Discussion). This work was supported by The Israel Science Foundation (Grant 1012/09). 1990. Adhesion receptors of the immune system. Nature 346: 425–434.
. 1992. Specific acceptance of cardiac allograft after treatment with antibodies to ICAM-1 and LFA-1. Science 255: 1125–1127.
. 1997. Biomechanical activation: an emerging paradigm in endothelial adhesion biology. J. Clin. Invest. 99: 1809–1813.
. 1998. LIGHT, a novel ligand for lymphotoxin beta receptor and TR2/HVEM induces apoptosis and suppresses in vivo tumor formation via gene transfer. J. Clin. Invest. 102: 1142–1151.
. 2005. 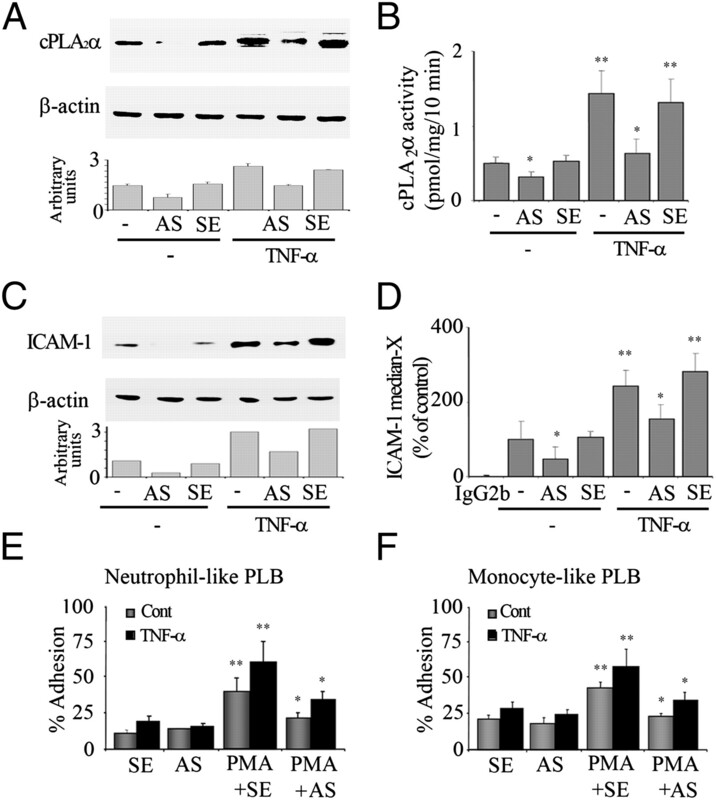 TNF-related activation-induced cytokine enhances leukocyte adhesiveness: induction of ICAM-1 and VCAM-1 via TNF receptor-associated factor and protein kinase C-dependent NF-kappaB activation in endothelial cells. J. Immunol. 175: 531–540.
. 1997. Flanking sequences for the human intercellular adhesion molecule-1 NF-kappaB response element are necessary for tumor necrosis factor alpha-induced gene expression. J. Biol. Chem. 272: 15928–15935. 1994. Diversity of group types, regulation, and function of phospholipase A2. J. Biol. Chem. 269: 13057–13060. 1997. The growing phospholipase A2 superfamily of signal transduction enzymes. Trends Biochem. Sci. 22: 1–2.
. 1990. Purification of a 110-kilodalton cytosolic phospholipase A2 from the human monocytic cell line U937. Proc. Natl. Acad. Sci. USA 87: 7708–7712.
. 2000. Prostaglandin E2 and the protein kinase A pathway mediate arachidonic acid induction of c-fos in human prostate cancer cells. Br. J. Cancer 82: 2000–2006.
. 1994. Arachidonic acid increases c-fos and Egr-1 mRNA in 3T3 fibroblasts by formation of prostaglandin E2 and activation of protein kinase C. J. Biol. Chem. 269: 27258–27263.
. 2004. Cytosolic phospholipase A2 is responsible for prostaglandin E2 and leukotriene B4 formation in phagocyte-like PLB-985 cells: studies of differentiated cPLA2-deficient PLB-985 cells. J. Leukoc. Biol. 76: 176–184.
. 2007. Adipocyte death, adipose tissue remodeling, and obesity complications. Diabetes 56: 2910–2918.
. 2008. Neutrophils transiently infiltrate intra-abdominal fat early in the course of high-fat feeding. J. Lipid Res. 49: 1894–1903.
. 1973. Culture of human endothelial cells derived from umbilical veins. Identification by morphologic and immunologic criteria. J. Clin. Invest. 52: 2745–2756.
. 1998. Essential requirement of cytosolic phospholipase A2 for activation of the phagocyte NADPH oxidase. J. Biol. Chem. 273: 441–445.
. 2004. Labour is associated with increased expression of type-IIA secretory phospholipase A2 but not type-IV cytosolic phospholipase A2 in human myometrium. Mol. Hum. Reprod. 10: 799–805.
. 2000. The requirement of both extracellular regulated kinase and p38 mitogen-activated protein kinase for stimulation of cytosolic phospholipase A(2) activity by either FcgammaRIIA or FcgammaRIIIB in human neutrophils. A possible role for Pyk2 but not for the Grb2-Sos-Shc complex. J. Biol. Chem. 275: 12416–12423.
. 2006. Induction of Fc gammaRIIA expression in myeloid PLB cells during differentiation depends on cytosolic phospholipase A2 activity and is regulated via activation of CREB by PGE2. Blood 108: 1758–1766.
. 2005. Superoxide dismutase inhibits the expression of vascular cell adhesion molecule-1 and intracellular cell adhesion molecule-1 induced by tumor necrosis factor-alpha in human endothelial cells through the JNK/p38 pathways. Arterioscler. Thromb. Vasc. Biol. 25: 334–340.
. 1994. Monocyte dysfunction in patients with Gaucher disease: evidence for interference of glucocerebroside with superoxide generation. [see comments] Blood 83: 2646–2653.
. 2003. Obesity-induced inflammatory changes in adipose tissue. J. Clin. Invest. 112: 1785–1788.
. 2004. Higher production of IL-8 in visceral vs. subcutaneous adipose tissue. Implication of nonadipose cells in adipose tissue. Am. J. Physiol. Endocrinol. Metab. 286: E8–E13.
. 2007. Obesity, inflammation, and insulin resistance. Gastroenterology 132: 2169–2180.
. 2003. Interleukin-6 (IL-6) induces insulin resistance in 3T3-L1 adipocytes and is, like IL-8 and tumor necrosis factor-alpha, overexpressed in human fat cells from insulin-resistant subjects. J. Biol. Chem. 278: 45777–45784.
. 1999. A comparison of primary endothelial cells and endothelial cell lines for studies of immune interactions. Transpl. Immunol. 7: 239–246.
. 1996. Regulation of intracellular pH by phospholipase A2 and protein kinase C upon neutrophil adhesion to solid substrata. FEBS Lett. 393: 117–120.
. 2000. CX3C-chemokine, fractalkine-enhanced adhesion of THP-1 cells to endothelial cells through integrin-dependent and -independent mechanisms. J. Immunol. 164: 4313–4320.
. 2002. OxLDL upregulates CXCR2 expression in monocytes via scavenger receptors and activation of p38 mitogen-activated protein kinase. Cardiovasc. Res. 53: 524–532.
. 2005. Inhibitory effects of ethanol extract from Radix Ophiopogon japonicus on venous thrombosis linked with its endothelium-protective and anti-adhesive activities. Vascul. Pharmacol. 43: 157–163.
. 2009. Regulatory role of cytosolic phospholipase A2alpha in NADPH oxidase activity and in inducible nitric oxide synthase induction by aggregated Abeta1-42 in microglia. Glia 57: 1727–1740.
. 2003. The expression of brain cyclooxygenase-2 is down-regulated in the cytosolic phospholipase A2 knockout mouse. J. Neurochem. 87: 1471–1477.
. 2000. Endothelial cell oxidative stress and signal transduction. Biol. Res. 33: 89–96.
. 2009. Nox4 overexpression activates reactive oxygen species and p38 MAPK in human endothelial cells. Biochem. Biophys. Res. Commun. 380: 355–360.
. 2008. Regulating gene transcription in response to cyclic AMP elevation. Cell. Signal. 20: 460–466.
. 2009. Nuclear NF-kappaB p65 phosphorylation at serine 276 by protein kinase A contributes to the malignant phenotype of head and neck cancer. Clin. Cancer Res. 15: 5974–5984.
. 1990. Structural characteristics of the 5′ region of the human ICAM-1 gene. Immunobiology 182: 79–87.
. 1991. Isolation and characterization of the promoter region of the human intercellular adhesion molecule-1 gene. Int. Immunol. 3: 83–93.
. 1998. Selective inhibitors of cytosolic or secretory phospholipase A2 block TNF-induced activation of transcription factor nuclear factor-kappa B and expression of ICAM-1. J. Immunol. 161: 3421–3430.
. 2001. Cytosolic phospholipase A(2)-mediated ICAM-1 expression is calcium dependent. J. Surg. Res. 99: 307–310.
. 2006. Endothelial cell cortactin coordinates intercellular adhesion molecule-1 clustering and actin cytoskeleton remodeling during polymorphonuclear leukocyte adhesion and transmigration. J. Immunol. 177: 6440–6449.
. 1999. CREB: a stimulus-induced transcription factor activated by a diverse array of extracellular signals. Annu. Rev. Biochem. 68: 821–861.
. 2007. TNF-alpha-induced NF-kappaB/RelA Ser(276) phosphorylation and enhanceosome formation is mediated by an ROS-dependent PKAc pathway. Cell. Signal. 19: 1419–1433.
. 2002. Role of neutrophil NADPH oxidase in the mechanism of tumor necrosis factor-alpha -induced NF-kappa B activation and intercellular adhesion molecule-1 expression in endothelial cells. J. Biol. Chem. 277: 3404–3411.
. 2006. 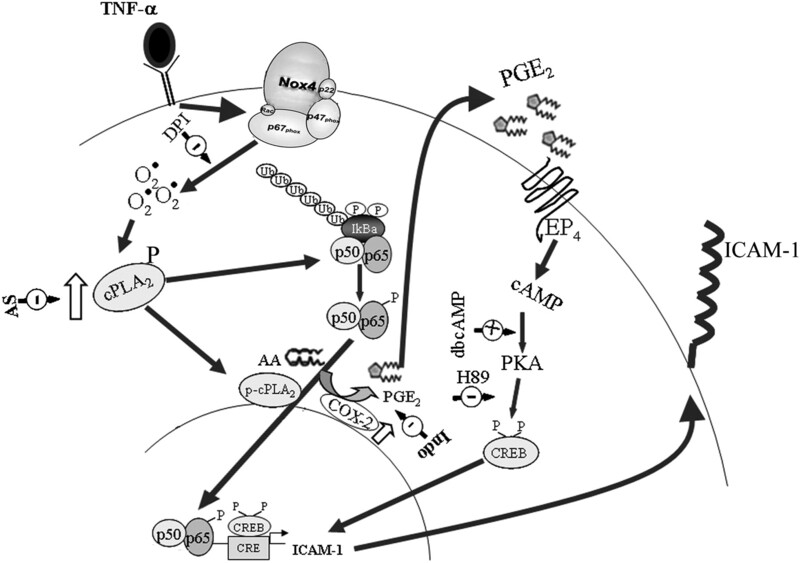 Redox-sensitive kinases of the nuclear factor-kappaB signaling pathway. Antioxid. Redox Signal. 8: 1791–1806.
. 2007. Extracellular HIV-1 Tat enhances monocyte adhesion by up-regulation of ICAM-1 and VCAM-1 gene expression via ROS-dependent NF-kappaB activation in astrocytes. Exp. Mol. Med. 39: 27–37.
. 2005. Upregulation of TNF-alpha-induced ICAM-1 surface expression by adenylate cyclase-dependent pathway in human endothelial cells. J. Cell. Physiol. 202: 434–441. 1997. Transcriptional regulation by cyclic AMP. Annu. Rev. Biochem. 66: 807–822.
. 2003. Cyclooxygenase-2 induction by bradykinin in human pulmonary artery smooth muscle cells is mediated by the cyclic AMP response element through a novel autocrine loop involving endogenous prostaglandin E2, E-prostanoid 2 (EP2), and EP4 receptors. J. Biol. Chem. 278: 49954–49964.